Modern society makes getting healthy harder than ever. People are busy trying to balance work, family and other responsibilities. As a result, their health goals are often put on hold. That said, being healthy does not have to be difficult. Here are 22 simple ways to get healthier with minimal effort. Vegetables can be loosely classified as starchy and non-starchy vegetables. Starchy vegetables generally have more carbs and calories than their non-starchy counterparts. Examples of starchy vegetables include potatoes, corn and navy beans. Non-starchy vegetables include spinach and other dark green leafy vegetables, carrots, broccoli and cauliflower. Filling half of your plate with non-starchy vegetables is a simple way to make your diet healthier. They are low in calories but packed with nutrients, fiber and water. By replacing some of the starch and protein of your meal with non-starchy vegetables, you can still eat a similar amount of food — but with fewer calories. This simple strategy also saves you the hassle of worrying about serving sizes and calories. SUMMARY:Filling half of your plate with non-starchy vegetables is a simple way to eat healthier. Vegetables are low in calories and high in fiber and nutrients. Believe it or not, the size of your plate can affect how much you eat. In one study, scientists found that people who ate from large serving bowls ate 56% (142 calories) more food than people who ate from smaller bowls. In an analysis of 72 studies, scientists found that people consistently ate more food when offered larger portions and plates. The simple illusion of eating from a smaller plate could help you feel satisfied with less food. SUMMARY:Eating from a smaller plate is a simple way to trick your brain into eating less. This can be useful if you feel the portions you eat are too big. Refined carbs are commonly known as simple carbs or “empty” carbs. They are rigorously processed and stripped of nearly all their nutrients and fiber. This means they add extra calories to your diet with no nutritional benefit. Examples of refined carbs include white flour, white bread, and white rice. Not to mention, eating a diet rich in refined carbs may increase your risk of chronic diseases, such as heart disease and type 2 diabetes. Choosing whole, unprocessed carbs like whole wheat flour and brown rice lets you eat the foods you normally eat with the added benefits of fiber, vitamins, minerals and other nutrients. SUMMARY:Refined carbs are sources of “empty” calories and provide no nutritional benefit. Swapping them for whole, unprocessed carbs can increase your nutrient and fiber intake. Fruit is a great way to add some color and flavor to your morning oats. Fruit is loaded with plenty of vitamins and minerals that are essential for optimal health. It also has plenty of fiber and water that can help you stay fuller for longer. In addition, fruit is a great source of polyphenols — compounds that give fruits and vegetables their bright color. These compounds act as antioxidants in the body and can help it fight inflammation. Additionally, studies have shown polyphenols may help reduce your risk of heart disease, type 2 diabetes and an early death. A study with 7,447 participants found that people who ate the most polyphenols had a lower risk of an early death than people who ate the least polyphenols. SUMMARY:Although fruit can be high in sugar, it is also packed with plenty of vitamins, minerals and compounds, such as polyphenols. Polyphenols may have great health benefits. Fatty fish like salmon are some of the most nutritious foods on the planet. They are an excellent source of omega-3 fatty acids — a type of essential fat that you can only get from the diet. Despite their importance, very few people in Western countries eat enough omega-3 fatty acids. Research has shown that people who consistently eat the most omega-3 fatty acids tend to have a lower risk of heart disease, less chronic inflammation and better mental health. In addition, fatty fish are a great source of B vitamins. This group of vitamins helps the body make energy, repair DNA and maintain healthy brain and nerve function. Aim to eat at least two servings of fatty fish per week. Great examples are salmon, mackerel, and herring. SUMMARY:Fatty fish like salmon, mackerel and herring are great sources of omega-3 fatty acids and B vitamins. Aim to eat fatty fish at least twice a week. Whole foods are typically the preferred way to meet your nutritional needs. They contain a variety of nutrients that have synergy together, helping deliver most of their nutritional benefits. That said, many people struggle to meet their daily nutritional needs through foods alone. That’s where supplements can come in handy because they provide you with a great dose of nutrients in a convenient package. Two supplements that are especially useful are soluble fiber and fish oil. Soluble fiber supplements like glucomannan can help you stay fuller for longer, keep you regular, reduce your blood sugar and lower your blood cholesterol. Fish oil supplements provide you with a great dose of omega-3, just like fatty fish. Diets high in omega-3 fatty acids are linked with a lower risk of heart disease, less chronic inflammation, and better mental health. SUMMARY:Although whole foods are preferable, supplements can be helpful if you struggle to eat enough nutrients from diet alone. Two great supplements are fish oil and soluble fiber, such as glucomannan. Green tea is one of the healthiest beverages you can drink. It is low in calories and packed with plenty of nutrients and antioxidants. These antioxidants can help your body fight free radicals — molecules that have been shown to increase disease risk and speed aging. Studies have also shown that people who drink the most green tea tend to live longer, have a lower risk of heart disease and a lower risk of type 2 diabetes. Green tea also contains epigallocatechin gallate (EGCG) and caffeine. These compounds may help you burn fat by boosting your metabolism. SUMMARY:Green tea is one of the healthiest beverages you can drink. It is low in calories, yet rich in nutrients and antioxidants. It also has impressive health benefits. It is no secret that Americans love their coffee. In fact, one study found that over 160 million Americans drink coffee regularly. However, roughly two-thirds of people add sugar, milk, cream or other additives. Unfortunately, that means your coffee may be sneaking extra calories into your diet. For instance, a tall latte from Starbucks contains 204 calories and 14.4 grams of sugar. In comparison, a cup of brewed coffee or an Americano contains fewer than 15 calories. Simply switching to a black coffee can cut extra calories from your diet without sacrificing your caffeine hit. SUMMARY:Switching from milky and sugary coffee to black coffee is a great way to cut your calorie intake while still enjoying coffee’s benefits. If you want to be healthier, try to avoid sugary drinks. They contain no essential nutrients and are loaded with added sugar. For instance, a can of Coca-Cola contains 39 grams or 10 teaspoons of sugar. Research has shown that sugar-sweetened beverages may increase your risk of type 2 diabetes, heart disease, and even certain cancers. In addition, the acids in soft drinks can damage your teeth, especially when combined with sugar. If you drink a lot of soda, opt for a healthier beverage like unsweetened sparkling water with lemon. SUMMARY:Sugary sodas are bad for your health and loaded with added sugar. If you drink a lot of soda, opt for a healthier beverage like green tea. Cravings often derail attempts at eating healthy. In fact, roughly 50% of people have food cravings on a regular basis. This can make unhealthy foods quite appealing. Stocking your pantry with healthy snacks can help you fight cravings when they arise. It’s also a great idea to keep some healthy snacks in your bag or purse to help fight cravings when you’re on the go. Some great healthy snacks include a handful of nuts, fruit or even a little bit of dark chocolate. You can find more healthy snacks here. SUMMARY:Cravings can often derail an attempt to eat healthier. To stave off cravings, make sure you have plenty of healthy snacks are available in your pantry and with you while you’re on the go. Water is important for your health. Drinking enough water can help maintain healthy brain function, concentration and a positive mood. In addition, water may help you lose weight by keeping you full and increasing how many calories you burn. If you find it difficult to drink enough water, try having a glass with each meal. This ensures you drink at least a few glasses of water each day. SUMMARY:Water is important for optimal health and performance. If you struggle to drink enough water, try to have a glass with each meal. A grocery list is a powerful tool that can help you eat healthier. It helps you remember what you have at home, plan for healthier food in advance and avoid impulse buys. What’s more, studies have shown that people who use grocery lists are more likely to eat healthier and carry less weight. SUMMARY:A grocery list can help you make healthier decisions when shopping and prevent impulse buys. Studies have also shown that lists can help you eat healthier. Shopping on an empty stomach can be a disaster if you’re trying to get healthy. In fact, studies have shown that people tend to buy more high-calorie foods when they shop on an empty stomach. By shopping after a meal, not only are you more likely to avoid unhealthy impulse buys, but you will probably save some money, too. This strategy would work even better when combined with a grocery list. 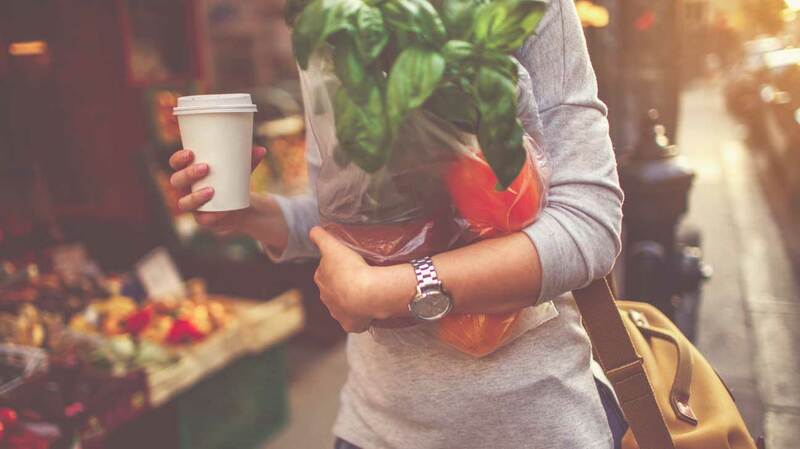 SUMMARY:Shopping on an empty stomach can make you more likely to make impulse buys. Try shopping after a meal to avoid temptations in the supermarket. People in Western countries are eating more highly processed foods than ever before. While processed foods are convenient, they often lack nutrients and increase your risk of chronic diseases. Simply eating more real foods can help you get healthier with minimal effort. Real foods tend to have more fiber and are packed with vitamins and minerals. Real foods are single-ingredient foods that are mostly unmodified and lack any chemical additives. SUMMARY:In modern society, people are eating more highly processed foods than ever, which are low in nutrients. Simply choosing real foods can help you eat healthier as they have more nutrients and fiber. Mindful eating is a powerful tool that helps you eat healthier with minimal effort. It is based on the concept of mindfulness and helps you pay attention to what you are eating, why you are eating and how fast you are eating. In addition, many studies show that mindful eating can help you lose weight. Here are a few simple tips that can help you become a more mindful eater. Focus on how you feel when you’re eating — are you actually hungry? Turn off the TV and put your phone away. You can find more helpful tips on mindful eating here. SUMMARY:Mindful eating is a powerful tool to help you eat healthier. It helps you pay attention to what, why and how fast you are eating. In today’s fast-paced society, people are always eating on the go. However, research has shown that eating on the go can affect your ability to process hunger signals. For instance, a study with 60 women discovered that people consumed more food and overall calories if they ate while walking. Sitting down is also a form of mindful eating. Combine it with a few other tips above to eat healthier with less effort. SUMMARY:Sitting down while you eat can help you process hunger signals better and eat less overall food. Finding time to exercise is a real problem for many people around the world, especially with work. However, regular exercise is important for a healthy lifestyle. In fact, there is plenty of evidence that shows a lack of exercise is linked with poor mental and physical health. That said, there are many ways to fit exercise into your day — even with a busy schedule. For instance, walking during your lunch break can greatly improve your health and well-being. In one study, 56 people walked for thirty minutes three times a week during their lunch break. This improved their enthusiasm and relaxation at work, while also reducing nervousness. SUMMARY:Walking during your breaks is a great way to fit exercise into a busy schedule. Try walking with a few colleagues to help make it a habit. Taking the stairs is a simple way to add exercise to your daily routine. It is also great for your long-term health. Research has shown that people who climb at least eight flights of stairs daily have a 33% lower risk of death than people who spend most of their time sitting. What’s more, taking the stairs may actually be faster than taking an elevator. One study discovered that, on average, taking the stairs was 23.5 seconds faster per flight of stairs. This includes the average waiting time for an elevator. If you are constantly moving between levels in your office, taking the stairs could help improve your fitness and productivity. SUMMARY:Taking the stairs is a great way to fit exercise into your routine. Surprisingly, it also seems to be faster than taking an elevator. People are sitting for longer than ever before. In fact, research shows that the average office worker spends 15 hours of their day sitting. In comparison, an agricultural worker sits for around 3 hours per day. Unfortunately, research has shown that people who sit the most have a higher risk of heart disease, type 2 diabetes, cancer, and death. A standing desk could help you be on your feet for longer while still being productive. Not to mention, research has even shown that people in the same job who use standing desks were 53% more productive over six months. SUMMARY:A standing desk could help you stay on your feet longer while working. Studies show that people who sit for longer have a higher risk of chronic diseases. Quality sleep is absolutely essential for optimal health. However, roughly 50 to 70 million Americans suffer from poor sleep. It seems that technology and other sources of artificial light are a big reason for poor sleep. These devices emit blue light, a type of light wave that is common during the day. However, this means your devices may tricking your brain to think it is daytime. Not to mention, research has shown that using artificial light before bed is linked with a higher risk of breast cancer, mood disorders, and depression. Avoiding technology an hour before bed may help improve your quality of sleep. SUMMARY:If you suffer from poor sleep, try avoiding technology an hour before bed. Devices like your phone and computer emit blue light, which can keep you up for longer. Besides poor sleep quality, a lot of people struggle to fall asleep. It can leave you exhausted, feeling sluggish and even increase your risk of chronic diseases like heart disease and type 2 diabetes. One of the biggest culprits is not having a regular sleep schedule. Having a set bedtime helps train your body’s internal clock to fall asleep faster at a certain time. In addition, a set sleep schedule may also improve your concentration and memory. SUMMARY:Having a set sleep time, even on weekends, can help you get to sleep faster. It helps train your internal clock to fall asleep at a set time. Stress can have a major toll on your overall health. Research has shown that meditation is an effective way to alleviate stress and improve your overall health. For instance, an analysis of 47 studies with over 3,500 people discovered that mindful meditation helped reduce anxiety, depression, and stress. You can learn more about the benefits of meditation here. SUMMARY:Meditation is a great way to relieve stress. Try incorporating it into your routine a couple times per week. Being healthy is easier than you think. In fact, there are many ways that you can get healthy with minimal effort. These include having a glass of water with each meal, eating fatty fish, having a regular sleep schedule and choosing more real foods. Additionally, shopping on a full stomach can help curb supermarket cravings and prevent impulse buys, while mindful eating can help you take control of your eating habits. Adding just a few of these strategies into your daily routine can lead to a healthier and happier lifestyle. NextA secret has been uncovered: Cancer is not a disease but a business!